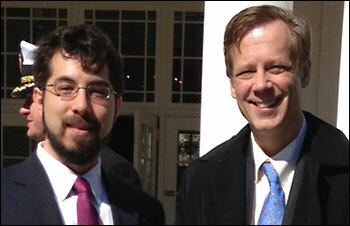 WASHINGTON, April 4, 2013 — Neuroscientists and bioengineers — including the inventor of a neuronal control technique involving gene therapy and lasers — voiced support this week for the BRAIN Initiative, unveiled by President Barack Obama at a White House press conference on Tuesday. The brain mapping research effort aims to revolutionize our understanding of the human mind and to uncover ways to treat, prevent and cure disorders such as Alzheimer's, Parkinson's, schizophrenia, autism, epilepsy and traumatic brain injury. "As humans, we can identify galaxies light-years away, we can study particles smaller than an atom. But we still haven't unlocked the mystery of the three pounds of matter that sits between our ears," the president said. The BRAIN Initiative, short for Brain Research through Advancing Innovative Neurotechnologies, is one of the administration's "Grand Challenges" and builds on the president's 2013 State of the Union call for historic investments in research and development to spur innovation, job creation and economic growth. The project is being launched with approximately $100 million in funding for research supported by the National Institutes of Health (NIH), DARPA and the National Science Foundation (NSF) in the president's 2014 budget, which has to be approved by Congress. 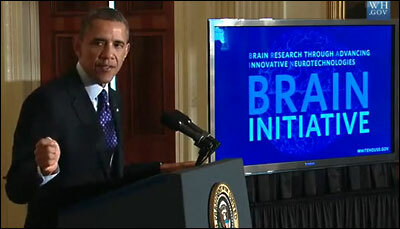 In this still from a White House video, President Barack Obama unveils the BRAIN Initiative on Tuesday. The project aims to revolutionize our understanding of the human mind and develop treatments for disorders such as Alzheimer's and Parkinson's. The initiative seeks to accelerate the invention of new technologies that will help researchers produce real-time pictures of complex neural circuits and visualize the rapid-fire interactions of cells that occur at the speed of thought. A key goal will be to accelerate the development of new technologies to visualize brain activity and to understand how this activity is linked to behavior and to brain disorders. The president compared the scale of the endeavor with the Human Genome Project, a 13-year project that identified all the approximately 20,000 to 25,000 genes in human DNA and which Obama noted returned $140 to the economy for every $1 invested. The specifics of the project have yet to be defined, so a "dream team" of 15 scientists, led by Dr. Cornelia I. Bargmann of The Rockefeller University and Dr. William Newsome of Stanford University, will establish goals and a multiyear road map, plus cost estimates for achieving them. Federal research agencies also will partner with companies, foundations and private research institutions that are investing in relevant neuroscience research, such as the Allen Institute for Brain Science, which will spend at least $60 million a year to support projects related to the initiative; the Kavli Foundation, which will commit about $4 million a year over the next 10 years; the Howard Hughes Medical Institute, which will contribute at least $30 million a year; and the Salk Institute for Biological Studies, which will dedicate more than $28 million. Also attending the press conference were NIH Director Dr. Francis Collins and DARPA Director Dr. Arati Prabhakar, and promiment figures from the neurobiology community, including MIT professors Ed Boyden, Emery Brown, Robert Desimone and Sebastian Seung. 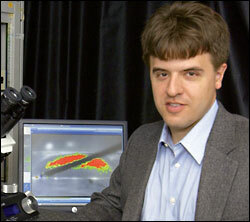 Boyden pioneered the development of new technologies for studying brain activity. Desimone is director of MIT’s McGovern Institute for Brain Research, which conducts research in many areas relevant to the new initiative. Seung, a professor of computational neuroscience and physics, is a leader in the field of “connectomics,” the effort to describe the wiring diagram of the brain. Stanford's Deisseroth said he was heartened to see that the initiative acknowledged the importance of fundamental research for the progress of science and medicine. "This is a key point that I have long worked hard to make and is particularly true in the study of the brain," he said. "The mysteries and complexities that await us in studying neuroscience are so profound that broad-based and pure science and technology development are needed, rather than dictated paths of research, even for our applied goals of reducing the burden of brain disease in the human population and easing suffering in our patients with neuropsychiatric illness." Other scientific organizations publicly applauding the BRAIN Initiative include The Optical Society (OSA) and the Max Planck Florida Institute for Neuroscience in Jupiter. "OSA members have made many contributions to the field of neuroscience, and the BRAIN Initiative would provide a much-needed resource for those advancements to continue," OSA CEO Elizabeth Rogan said. 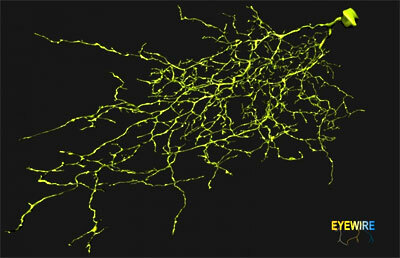 Some of those landmark contributions include the increasing resolution of imaging technologies and techniques that combine advanced genetics and optics, such as the use of pulses of light to determine how specific cell activities in the brain affect behavior. "In the last five years, we've only just cracked open the door to technologies that make the impossible finally possible," said Dr. David Fitzpatrick, scientific director and CEO of the Max Planck Florida Institute — the Max Planck Society's first institute outside of Europe. "You can't fix it if you don't know how it works. If we can't get to this detailed level of understanding of brain organization and activity, then we're not going to be in a position to effectively address brain disorders." Deisseroth, a professor of bioengineering and of psychiatry and behavioral sciences, invented optogenetics, which uses gene therapy and lasers to allow scientists to control how neurons fire in live animals and indicates how those neurons affect behavior. He was also one of the 13 scientists to propose the initiative — then referred to as the Brain Activity Map — last month in Science. As challenging as the BRAIN project is — the average brain contains about 100 billion neuron cells, or as many cells as there are stars in the Milky Way — the Max Planck Florida Institute is convinced that the journey is well worth this new, large-scale research initiative. The institute currently has nine research groups investigating the mysteries of the brain. "I don't know how many years it will take, but I think, ultimately, when a person shows up for medical help in a clinic, we'll be able to do a series of tests that will allow us to diagnose how the balance of activity within their neural circuits has been altered and what needs to be done to bring that imbalance back into a normal range," Fitzpatrick said. "The information that will come from the brain mapping project will lay the foundation for making this a reality."